"LET us hear the conclusion of the whole matter: Fear God, and keep his commandments; for this is the whole duty of man. For God shall bring every work into judgment, with every secret thing, whether it be good, or whether it be evil." The record of every life is written in the books of heaven. Every sin that has been committed is there registered. Every regret for sin, every tear of repentance, every confession of guilt, and the forsaking of every darling sin, is also recorded. When the judgment shall sit and the books are opened, every case will have to stand the test of the law of God. God has a law by which he governs intelligences both in heaven and in earth. Jehovah is the supreme Governor of nations, and no greater or more fatal deception could take hold on human minds than that which leads men to declare that the law of God has been abolished. Were this so there could be no judgment; for there would be no rule by which character could be tested, and actions weighed. But we read that the judgment is to sit, and that the books are to be opened, and that every man is to be rewarded according as his works have been. If God has no moral standard by which to measure character, there can be no judgment, no reward. But, according to the unerring word of God, every man will be judged and rewarded according as his works have been, and we are admonished to so speak and to so do as "they that shall be judged by the law of liberty." When sin has been repented of, confessed, and forsaken, then pardon is written against the sinner's name; but his sins are not blotted out until after the investigative judgment. No finite being can tell how his case stands in the sight of Him whose eyes are like a flame of fire, who says: "I know thy works. . . . I counsel thee to buy of me gold tried in the fire, that thou mayest be rich; and white raiment, that thou mayest be clothed, and that the shame of thy nakedness do not appear; and anoint thine eyes with eye salve, that thou mayest see. As many as I love, I rebuke and chasten; be zealous therefore, and repent." Those who presume to think that the law of God has been done away, and that it no longer exists, have set up an imperfect standard of their own. Measuring themselves by their own finite standard, they pronounce themselves pure and perfect. Satan has just such a standard, by which he declares that he is righteous; but these false standards cannot compare with God's unerring standard of righteousness. No one who has an appreciation of the verity of the law of God will claim an exalted character for himself. Our true position, and the only one in which there is any safety, is that of repentance and confession of sins before God. Feeling that we are sinners, we shall have faith in our Lord Jesus Christ, who alone is able to pardon transgression, and impute unto us righteousness. When the times of refreshing shall come from the presence of the Lord, then the sins of the repentant soul who received the grace of Christ and has overcome through the blood of the Lamb, will be removed from the records of heaven, and will be placed upon Satan, the scapegoat, the originator of sin, and be remembered no more against him forever. The sins of the overcomers will be blotted out of the books of record, but their names will be retained on the book of life. The True Witness says, "He that overcometh, the same shall be clothed in white raiment; and I will not blot out his name out of the book of life, but I will confess his name before my Father, and before his angels." When the conflict of life is ended, when the armor is laid off at the feet of Jesus, when the saints of God are glorified, then and then only will it be safe to claim that we are saved and sinless. True sanctification will not lead any human being to pronounce himself holy, sinless, and perfect. Let the Lord proclaim the truth of your character. John declares, "If we say that we have not sinned, we make him a liar, and his word is not in us." But we are to accept the precious promise that, "if we confess our sins, he is faithful and just to forgive us our sins, and to cleanse us from all unrighteousness." We shall make manifest by our works as to whether or not we have personal faith in Christ as our Saviour; for it is by the righteousness of Christ that we are sanctified. We are day by day to study the lessons of Christ, and grow up into him in all things. If we follow on to know the Lord, we shall know that his goings forth are prepared as the morning. He is perfecting Christian character after the divine model, is growing in faith, in influence and power, and this work will progress in his character until faith is lost in sight, and grace in glory. The righteousness of Christ is imputed to the obedient soul, and the peace of Christ is an abiding principle in the heart. "My little children, these things write I unto you, that ye sin not. 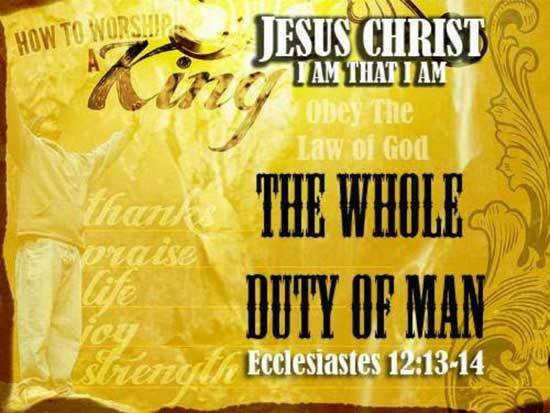 And if any man sin, we have an advocate with the Father, Jesus Christ the righteous." There is no quality in law to save the transgressor of the law. The law can condemn, but it cannot pardon, therefore the transgressor would have been left to perish in his wretchedness if a plan had not been devised for his salvation. Jesus Christ alone was able to save fallen man. He became man's surety and substitute. He became man's advocate to plead his case before the Father. It was for our sake that he condescended to become man. "The Word was made flesh, and dwelt among us (and we beheld his glory, the glory as of the only begotten of the Father), full of grace and truth." Christ became the comfort and hope of the fallen race. Our Saviour is the Son of man as well as the Son of God. He took humanity upon him, and presented a model for humanity in his pure and perfect character. "He did no sin, neither was guile found in his mouth." His life was as complete as a pattern, as his death was complete as a sacrifice. He was tempted in all points like as we are, therefore he knows how to succor those that are tempted. It should be to us a cause of continual gratitude and rejoicing that Jesus knows our weakness and is acquainted with our temptations. We are too much in the habit of thinking that the Son of God was a being so entirely exalted above us that it is an impossibility for him to enter into our trials and temptations, and that he can have no sympathy with us in our weakness and frailties. This is because we do not take in the fact of his oneness with humanity. He took upon him the likeness of sinful flesh, and was made in all points like unto his brethren, that he might be a merciful and faithful high priest in things pertaining to God. He has engaged himself to save every son and daughter of Adam who will consent to be saved in God's appointed way. While we are admonished to obedience, we are not to think that we can merit salvation by our good works. Salvation is the free gift of God, and it is to be received by faith. It is provided for the repentant soul by Christ through the great plan of redemption. But the proof of our love to him, the evidence of our faith, will be found in our obedience to God's holy law. Our Saviour says, "He that hath my commandments, and keepeth them, he it is that loveth me; and he that loveth me shall be loved of my Father, and I will love him, and will manifest myself to him." Christ enjoins upon us the keeping of the commandments because he knows that in keeping them there is great reward, the revealing of a character after the divine similitude. We must not dishonor God by unbelief in Christ as our Mediator; for he is fully able to save unto the uttermost all that come unto God by him. "And he is the propitiation for our sins; and not for ours only, but also for the sins of the whole world. And hereby we know that we know him, if we keep his commandments." Christ made it possible for fallen man to keep the commandments of God, for he will lift from the degradation of sin every fallen soul who will lay hold of the promises of God by faith, and comply with the conditions of salvation. The humanity of Christ is a marvel to the heavenly angels who are with him in the heavenly courts, and know the infinite price he paid for the redemption of man. They marvel at his grace given to the fallen race, so that, by becoming partakers of the divine nature, they may keep the law of Jehovah. These wonderful mysteries angels desire to look into.